How to do bay parking on your driving test. Bay parking doesn't have to be difficult. 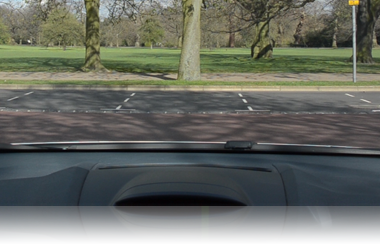 Let us show you the easiest way to reverse into a bay to the left, within the two lines and observing for other road users. When bay parking make sure that you always keep a look out for other people using the car park area, especially pedestrians and cyclists. Stop if anyone approaches you. The examiner will not tell you which bay to reverse into, this will be for you to decide. The bays will normally be empty on your driving test. You can also reverse bay park using the 45 degree method. Video on how to do bay parking. 1. Drive alongside the bays that you will use and stop about a metre (about a car doors width) away from them, straighten your car and stop. Select reverse and observe all around, especially behind you. 2. Once you've observed all around and it's safe, reverse in a straight line until you get to your point of turn. The reference point for this point of turn will be when the first line of the first bay disapears into the car near the door handle. 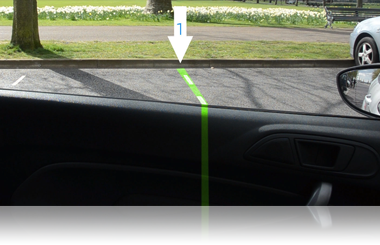 This point of turn can vary slightly depending on what car you're driving and in some cars it's possible to see the bays out of your backside window. Using this point of turn will get you into the third bay along. The arrow on the picture is pointing at the first line of the first bay and you will aim to go into the third bay along. Once you've observed all around, drive slowly and immediately steer quickly full lock (maximum) to the left. 3. Once you're in the bay and you can see that you are straight (check that your dashboard is running parallel with something in front, or you can see the side lines in your side mirrors) then straighten your wheels to the right and reverse straight into the bay. Observe over both your shoulders as you drive slowly. Stop once you're in the bay. As a last resort, you can drive forward to re-adjust your position and then reverse back in. That's how to do bay parking. Hope this has been useful. 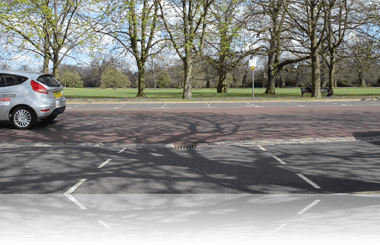 Read about the other driving test manoeuvres here including the 'turn in the road', 'parallel parking', 'reversing around a corner' and the 'emergency stop'.